Have we been dramatically underestimating elephant intelligence? We've long known that elephants are intelligent animals, who remember migration routes for decades and appear to mourn their dead. But a new study suggests we may have been underestimating them — because our methods of testing intelligence in animals are biased. In a fascinating National Geographic article, Karl Gruber describes new intelligence experiments on elephants that reveal the animals may be a lot more smell-oriented than we realized. Elephants use their noses the same way we use our hands, and their trunks are for sensing the world with touch as well as lifting things up to examine them. As a result, smell is as crucial to elephants as touch is to humans. But few scientific studies have ever used smell as a way of testing elephant intelligence. Until now. 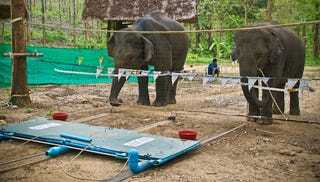 In the study, seven Asian elephants first had to choose between two buckets that were potential sources of food (one bucket had food and one didn't), a standard "location test" of animal smarts in monkeys, birds, dogs, and other creatures. The elephants were cued with a sound, the shaking of a closed bucket to reveal whether it contained sunflower seeds. In this first test, the elephants' odds of picking the full bucket were no better than chance. In the second part of the study, however, the elephants were allowed to smell one of two buckets, either an empty one or one that smelled of food. The elephants had to choose between the bucket they had smelled and a new, mystery bucket. Elephants that were first exposed to an empty bucket always rejected this bucket and selected the "mystery" bucket instead. This suggests that elephants are using smell as part of their decision-making process. They remember that the first bucket did not smell of food and choose the other option. In other words, when elephants had a smell cue, it allowed them to make more intelligent decisions than they did without it. These giant animals may be a lot smarter than we realize, and we just couldn't perceive it because we tested their IQs the same way we'd test human IQ. For too long, we have tested all sorts of animals on stimuli that we, humans, find most salient. We thus stack the deck against animals that differ from ourselves, and sometimes conclude from negative results that they are dumber than us.